Let’s talk side dishes, shall we? They’re mainly meant to be the wind beneath the wings of the main course. They usually don’t take very much effort to put together. They’re usually some kind of vegetable or starch. They’re also meant to be the back-up just in case the main dish doesn’t quite fill you up all the way. Side dishes in my family are kind of a big deal. Whether it’s for a holiday or special occasion, or just an ordinary dinner, we always take them pretty seriously, even to the point where they can be just as popular and in high demand as the main dish. Plain, store-bought steamed veggies that have just been heated up in a microwave? Uh, no. That’s not gonna fly ’round these parts. I’m gonna need for you to step up your game. My grandparents have their own vegetable garden and for as long as I can remember, we’ve been eating their produce for side dishes. My grandma’s greens are unsurpassed in the entire history of cooking. Period. I could seriously eat a bowl of her cabbage greens and cornbread every.single.day.of.my.life. No joke. Ditto with her green beans. Because of her, I had no problem eating my vegetables growing up. Smothered cabbage with bacon is another family favorite of ours- mine taste good, but I’m also willing to admit that Ashley’s taste slightly better (I said SLIGHTLY Ash, don’t get a big head). No one else really digs them, but I’m crazy about oven roasted brussel sprouts too. I also make a mean pot of barbecue baked beans for our cookouts. Don’t worry. Come Memorial Day, you guys will be getting that recipe. Then there’s baked corn. We’ve been eating this as a staple side dish in my family for a pretty long time now. One of my mom’s co-workers introduced it to her and from the first, we were huge fans. I’m sure many of you are familiar with this dish yourselves- and if you’re not, then you’re certainly gonna be. Because it’s not only really good, it’s also incredibly easy and quick to make. Most of the ingredients you probably already have in your kitchen, and you can put them together in a real ‘Jiffy’. I know. That was a really lame joke. Just try to bear with me here. 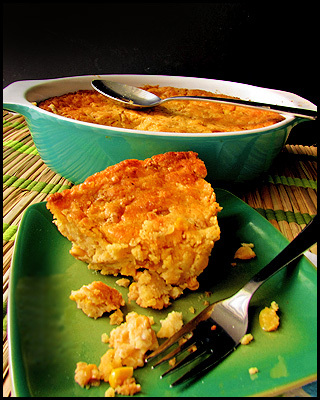 So for those of you that have never had it before, Baked Corn is like a cross between a very moist cornbread, and a tender corn souffle. 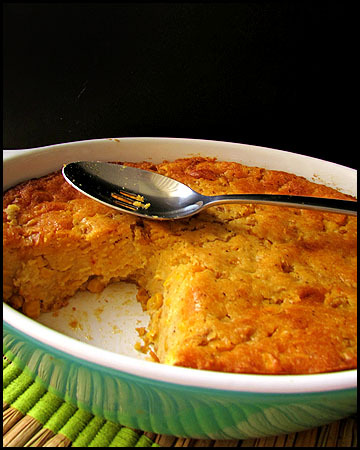 If you’ve ever had spoon bread, this is very close to that, only a little more spongy in texture. As I said before, it’s really very good. In addition, unlike when when cooking a souffle, you don’t have to worry about things like ice baths, or the casserole rising or falling once out of the oven. It’s almost embarrassing how simple this recipe really is. So have no fear beginner cook-letes. You’d be really hard pressed to mess it up. I’m giving a very basic, straight-forward version of this recipe, but after you try it for the first time and decide you love it (and you will), I’d recommend any number of ways to take it to the next level, even elevating it beyond a mere ”side-dish’. For instance, I could definitely see adding crumbled, pre-cooked sausage, ham or bacon along with a slew of diced onions and peppers to make this a ‘main casserole dish’. The original recipe also includes cheese- we’re not huge cheese fans in my family, so I never include it, but if you are then feel free to throw it on top of yours in the last 15 or so minutes of baking. 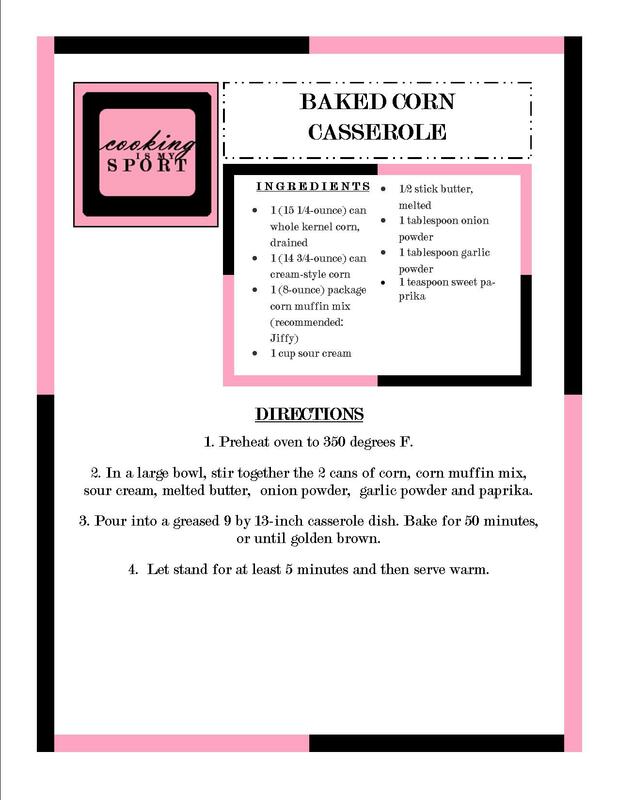 This is a really great dish not only for side dishes at dinner, but for a dish to pass at potlucks or picnics. It also tastes just as good cold as it does hot. I’ve never done it before, but I could easily see the casserole divided into muffin tins for individual portions as well- just be sure to lessen the baking time by about 15-20 minutes depending upon your oven. FEED(ME)BACK: What’s your favorite side dish? 2. 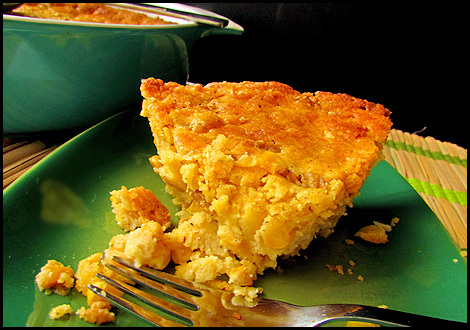 In a large bowl, stir together the 2 cans of corn, corn muffin mix, sour cream, melted butter, onion powder, garlic powder and paprika. 3. 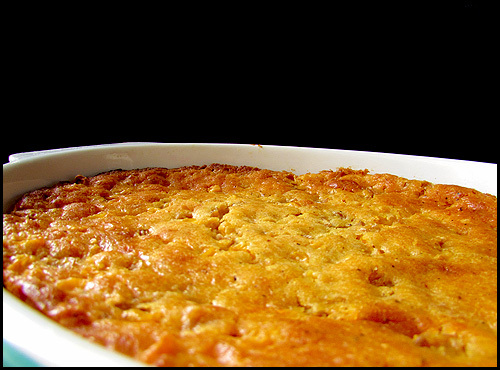 Pour into a greased 9 by 13-inch casserole dish. Bake for 50 minutes, or until golden brown. 4. Let stand for at least 5 minutes and then serve warm. Thanks for linking my post. Your recipe looks wonderful! This blog looks fantastic! Are those pictures of your food? How do you take your pictures? Seriously, great job! Thanks for the follow. I am excited to follow you! Hello! Yes, I take all of the pictures on the blog myself- thank you so much for the compliment. I don’t have a DSLR camera, but I do have a Canon Powershot SX510 HS. I use that, and natural lighting when photographing my food. I’m new to it, and I’m learning more and more with every dish.